In the last Langstaff Letter, I gave a brief overview of the Jesus Movement of the late 1960’s and 1970’s referring to a book ‘God’s Forever Family’ by Larry Eskridge. Here I want to look at 10 things we can learn from the Jesus People Movement that can be relevant to a future move of God amongst young people today, or any move of God that He would bring amongst us now. The Jesus People Movement, according to Eskridge, began with a converted Bohemian couple, Ted and Elizabeth Wise, who, in the counter culture of the 60’s in San Fransisco, got saved. Initially, they would be taking a trip on LDS on Saturday night and then going to church on Sunday morning. I wonder what unlikely group of people God may be planning to use to light some fires today. God can and does move in unexpected ways in unexpected places. The 1950’s and the early 1960’s was a time of relative stability in society even in regard to the youth of that day. But all that changed quickly as the 1960’s became a time of flux and change, that produced in society a counter cultural movement, which is still being felt fifty years later. Social and political crises arose, particularly in the civil rights revolution and then the reaction to the war in Vietnam. Young people began to throw off moral restraint, fueled by a sexual revolution and the advent of the pill. Drugs came on the scene and the whole world changed. Sometimes we despair at the changes that have occurred more recently, including gay marriage, but let us remember, it is often the midst of flux and change in society that God moves. Let’s expect God to move again. 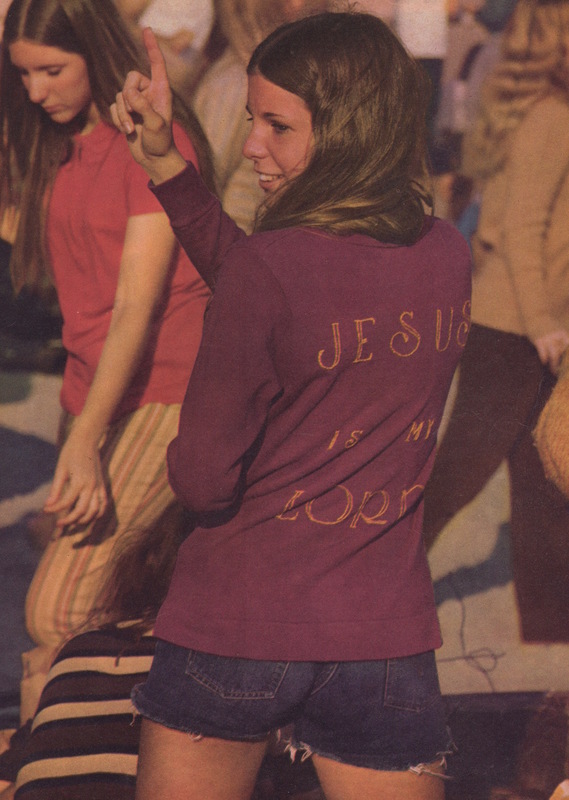 The Jesus Movement was not a direct reaction to what was happening in the counter culture of that day. Much of it was absorbed into their Christian viewpoint. They did not initially throw away drugs, communal living. Holding all things in common was practiced, which was also fueled by the reading of Acts 2. Over time, this evolved and changed, but initially they were not separate from some of societies ways. Sometimes we expect people to turn their back on everything they have ever known and try to instantly make them ‘holy.’ I remember a hippie who got saved He was living with his girl friend. He came to his pastor and said that God was ‘talking to him about fornication. What is fornication?’ It was then that things changed and today he is being mightily used of God. God’s grace prevailed where legalism might not have. It began with people who often had no real training or experience in teaching others in a Christian community, which brings us to the next point. It is obvious, as you read Eskridge’s book, that the movement suffered from the lack of mature leadership, particularly in the early days. Partly because pastors and leaders did not know how to relate to this new thing. Later people, like Chuck Smith of Calvary Chapel, got involved. But even he did not want to get involved to start with and it was his wife who first showed interest in the hippies at nearby Huntington Beach. Still later, some of them moved into the shepherding movement led by the Fort Lauderdale Five (Charles Simpson, Bob Mumford, Ern Baxter, Derek Prince and Don Basham), which also brought controversy into the Body of Christ. Contrast that with other movements, like the Wesleyan Revival and the way John Wesley was able to bring structure into the movement through the equivalent of small group ministry. This brought accountability and growth. The new street Christians took the Bible seriously, including a ‘literalistic interpretation of Scripture’ that led them into a heavy emphasis on Pentecostal and charismatic phenomena.’ They expected what they read in scripture about the early church to be happening in this present day and age. It was the intensity of their beliefs that set them apart from the church people of that day. In many ways they were radical about what they believed and sought to live. Today, as the Bible is increasingly under attack, we need to get back to the solid foundation of the Word of God. At a time when many Christians don’t read the Bible regularly, we need to become Bible reading Christians again. Maybe today we need to look again at eschatology and, in spite of the variety of eschatological viewpoints, at least remind people the Jesus is coming and it may be sooner than we think. One of the distinctive characteristics of the Jesus Movement was communal living. ‘While most Jesus People did not live in community, the ubiquity of communal houses and communes within the movement was so radically at odds with normal Christian life-styles that it definitely set it apart as something different’ as they sought to live out the book of Acts. Communal living has not ever been a lasting characteristic for most believers, none the less the emphasis on a closer relationship between believers is something needed today. We need to remember that music has always played a major part in any new move of God. That leaves an ongoing legacy. It is good to learn from our own history. Blessings.